It tells the story of Shravan Singh (Vineet Kumar Singh), a boxer with small means and small dreams. By current standards of crime and punishment, the political daring of Anurag Kashyap — the director and one of six writers of Mukkabaaz — could invite sedition charges, death threats, morchas around the country demanding a ban, apart from, of course, the tag of being an anti-national who needs to relocate to Pakistan. This opening scene is not critical to the film’s plot. But it is not superfluous either. It is intrinsically connected to the world in which his film is set. But gau politics is in his film by choice. By design. It, of course, burnishes the credentials of Anurag Kashyap the fearless director, and Anurag Kashyap the secular Indian. But, more importantly, it’s there to show these gau hatyas for what they really are. In a world where caste is politics — a world split between those who proudly say their name with a special, proud emphasis on the surname and those who meekly say Kumar at the end of their name, and then wait for the dreaded question “Pura naam?” — beef is the most convenient ruse to settle scores, personal and pushtaini. It adds a nice layer to the plot of Mukkabaaz, a film that scores very high on politics, but one that can barely contain the incredible performance of its lead actor, Vineet Kumar Singh. Mukkabaaz is set in Uttar Pradesh, in a world where bigotry of all kinds is frequent and flagrant, and is treated with a strange deference as it emanates from God-ordained higher beings, i.e. upper caste men. It tells the story of Shravan Singh (Vineet Kumar Singh), a boxer with small means and small dreams. Unlike others who are basically boxing for two eventual options — become the bodyguard of some VIP, or land a sarkari naukri on sports quota — Shravan is good and wants to box for the country. But who gets to do what depends entirely on Bhagwan Das Mishra (Jimmy Shergill), who controls the lives of boxers beyond the limits of his district, Bareilly. Pretty early in the film Shravan challenges and humiliates Mishra because he resents being ordered around to do menial chores. And soon, both his career and love life depend on the man he has insulted. And despite the advise of friends and well-wishers, refuses to grovel and drink Mishra’s piss. Literally. Shravan’s love story began with his defiance, but was initiated by Sunaina (Zoya Hussain), Mishra’s niece who can’t speak. 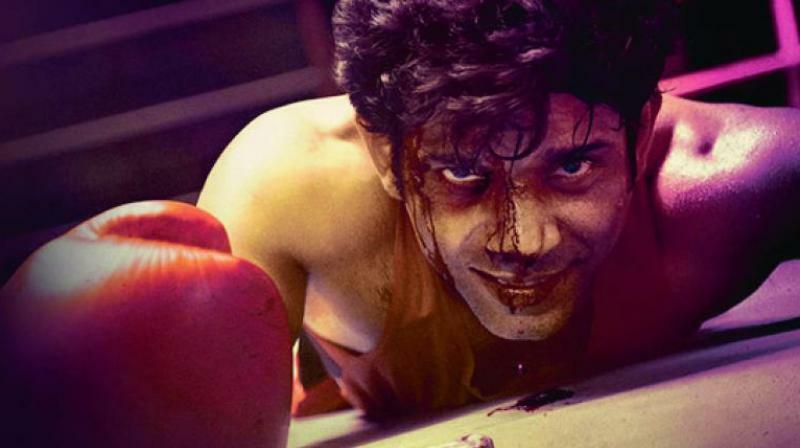 Here on, the film is about Shravan trying to get a shot at boxing at the district, and then the state level. En route we are treated to the politics of Indian sport. Caste is always at play. As are men with fragile egos and penile issues. Those not deserving the favour of powerful mai-baap coaches are ignored, cheated of their chances. And if they still manage to get ahead, their families are threatened. In between, we also see how petty officials mistreat sports quota recruits. Dekhiye, aisa hai, that when big stars of big Bollywood play “real” characters, or characters that require some sort of physical challenge, an incestuous ecosystem of commerce comes alive. Let’s call it the Commercial Transformation Machine. It begins with whispers about a star’s “new look”, followed by a shocking, strategic, accompanied-by-photo revelation of the “look”. This requires investigation undertaken by entertainment journalists, i.e. meetings organised by PR people with stars where they reveal how tough and transformative the whole physical renovation was. Mostly it’s the toughest role they have played. Magazine covers get assigned, Twitter, Facebook, Instagram drip-feed fans, and there are brand endorsements inside and outside the film. In the film, a lot of time is spent showing us just how rippled those muscles are. Veins, blue-blue ones, pop up and the camera goes closer to stare. Admiring, caressing the tiniest twitch, the pretty beads of sweat. The whole movie is relegated to being a vehicle for this OMG makeover. A la Mary Kom and that super annoying Bhaag Milkha Bhaag. There’s a fragment of a linear story since the film is populated by characters who are either devoted to marvelling at the star, and one lot who is jealous and thus trying to jeopardise the star’s climatic, glorious moment. No other character gets screen time, and the milieu doesn’t matter. So, then, Mukkabaaz, is a relief. Its hero has a six-pack that’s simply a mundane requirement for a man playing a boxer. It’s also a movie where the villain makes the screen sizzle, and who is just one of many engaging, interesting characters who have real roles with nice, crackling lines. And, without much ado, Mukkabaaz is about a love affair between a girl who can’t speak, and a man who is not seduced by his own devotion to excellence and talent. There is no nationalistic fervour when matches are being played. In fact, here, there are no packed stadiums with cheering, tiranga-leharaoing extras. Shot in real spaces, boxing bout in Mukkabaaz take place in desolate, sad stadiums, which seem to lack the basics. And it has that one thing most of big Bollywood cringes from. Politics. Mukkabaaz doesn’t just open with gau matas. Cow politics appears again. Twice. Once when a pateela full of biryani is delivered to the house of Shravan’s Harijan coach, Sanjay Kumar (Ravi Kishan), immediately followed by angry, armed men chasing the sniff of beef. And later, when Shravan beats up Mishra while shouting, with each angry punch, Bharat Mata ki Jai. Problem is that Mukkabaaz is 30 minutes too long. Its dialogue are fast and furious, and the colloquial exchanges bring to life scenes, characters with a strong cow-belt flavour, it also has long, sleepy spells where one man is boxing another, forever, without much drama. And there’s and uninteresting song starring Nawazuddin Siddiqui. The film has crackling scenes, especially the ones involving Jimmy Shergill and Vineet Kumar Singh. These scenes, sadly, remain stunning but separate parts that don’t quite come together. The film has an excellent ensemble of cast that is led by Jimmy Shergill, Vineet Kumar Singh and Zoya Hussain. All roles are entrusted to excellent actors. Watching the South Indian official at the railway office I though I’ll find him there if I were to ever visit. Shergill, with one bad eye, is menacing when he wants to be. Mostly he remains a laidback but impending threat. Vineet’s Shravan is often slighted, leading to outbursts that heat up the screen with the rage and grief of a man who is not getting a chance to show his talent. Zoya Hussain uses her entire body to give a razor-sharp performance of a girl in defiance, communicating her defiance in sign language. She is unforgettable.